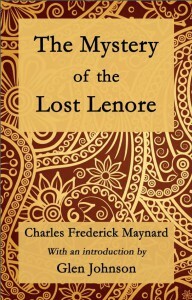 The Mystery of the Lost Lenore is a somewhat rousing tale of adventure by Charles Frederick Maynard. I would wager a rather large sum of money that you have never seen a camel climb a tree. Until this foolish expedition I had never seen such a thing either. If I live to be a hundred I hope never to see such a thing again. It is not, what I would call a pretty sight. But I am really being quite generous when I go ahead and use a word like “climb”. “Shoved up” would perhaps constitute a more accurate phraseology. What we did was, the four of us, for the ape wisely took no part in this foolish enterprise, got behind the poor thing and grabbing hold of its large beige derriere lifted and jammed the unfortunate beast up against the trunk of the tree hoping that it would naturally, and more or less of its own accord, work its way out onto the outstretched branch. It was an act of the purest optimism. The poor thing was really just confused and seemed more than a little alarmed by our efforts. It merely bugged out its already kind of bulgy eyes and waited for this latest terrible indignity to come to an end. Of course, it very shortly did as even the smallest of the camels was not supportable in this position for any great length of time. Discouraged and disheartened at having failed so miserably we all sat panting on the turf for some time before Hobie postulated an alternate scheme.